Thousands of people honored the slain rapper Nipsey Hussle at a memorial service Thursday morning at Staples Center, followed by a 25-mile procession through his native South Los Angeles. LOS ANGELES -- Nipsey Hussle's public memorial service kicked off with songs from his latest Grammy-nominated album, "Victory Lap," as family, friends and 21,000 others filled the Staples Center to honor the rap star's life and legacy. A montage of photos featuring the rapper from infancy, childhood and adulthood, with fellow rappers, his family and fiance actress Lauren London, were shown to the crowd, set to Frank Sinatra's "My Way." And R&B singer Marsha Ambrosius sang the Mariah Carey song "Fly Like a Bird" while fighting back tears. "This is for Nipsey, y'all" she said before she started as she tried to gain her composure, sighing heavily. Hussle's business partner Karen Civil read a letter written by Obama that said, in part: "While most folks look at the Crenshaw neighborhood where he grew up and only see gangs, bullets and despair, Nipsey saw potential. He saw hope." Fans poured into the Staples Center on Thursday to pay tribute to Hussle, slain last month in front of a store that he tried to use to empower his South Central neighborhood. Most who filed in for the public memorial were young adults but ages ranged from small children to the elderly. "We're not just here to get off work, we're not just here to take selfies outside Staples, we can do that anytime," said Wutup Levy, 27, of Long Beach, California. "We're here for a great man. We're all here for big Nip. It wasn't his time." "He was bigger than his music" she said. Books with an image of Hussle on the cover were handed out to service attendees. The book of nearly 100 pages contained numerous photos of Hussle with his fiancée Lauren London, his children, and friends like Russell Westbrook and Snoop Dogg. It also had heartfelt messages from Rick Ross, The Game and LeBron James. Stevie Wonder, Anthony Hamilton were among those set to perform at the memorial. The event was being livestreamed on BET and BET News' Facebook page, among other outlets. 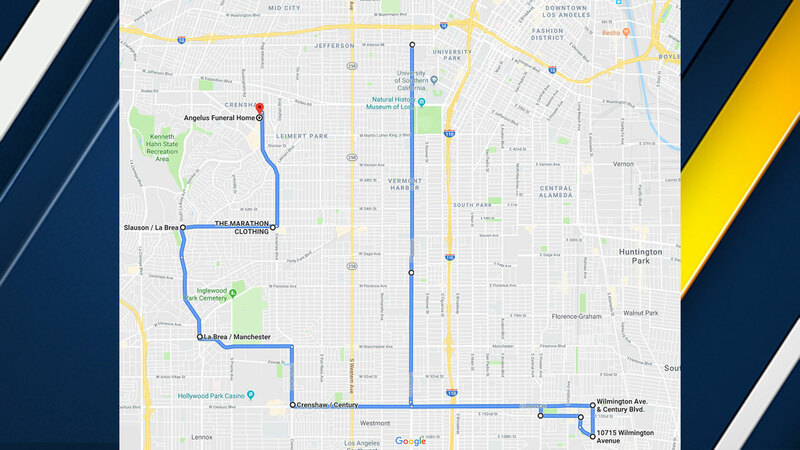 Staples Center released this map of the public procession that will follow Nipsey Hussle's Celebration of Life which starts at 10 a.m. on Thursday, April 11, 2019. The 33-year-old Grammy-nominated rapper, whose real name was Ermias Asghedom, was an Eritrean-American father of two. He was a beloved figure for his philanthropic work that went well beyond the usual celebrity "giving back" ethos. Following his death, political and community leaders were as quick and effusive in their praise as his fellow hip-hop artists. For a decade, Hussle released much sought-after mixtapes that he sold out of the trunk of his car, helping him create a buzz and gain respect from rap purists and his peers. His said his stage name, a play on the 1960s and '70s rhyming standup comic Nipsey Russell, was given to him as a teen by an older friend because he was such a go-getter - always hustling. ABC-Owned Television Stations contributed to this report.